Allegheny County is in the midst of an opiate overdose epidemic. The ability of County government and engaged stakeholders to implement evidence-based strategies to address this problem is limited by the fact that much about the victims and potential risk factors is unknown. A collaborative effort of the Allegheny County Department of Human Services and the Allegheny County Health Department, this report examines available data to identify areas for improvement and potential missed opportunities for intervention. These maps provide information about the location of opiate-related overdose deaths that occurred in 2008 through 2014. 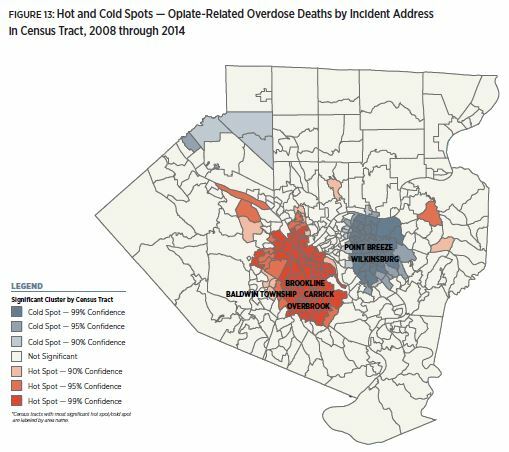 Overdose locations were determined by incident address and mapped for Pittsburgh City Council districts, Allegheny County Council districts, and Allegheny County municipalities. This dataset, in Excel workbook format, was used to produce the map of Opiate Overdose Deaths in Allegheny County Municipalities.